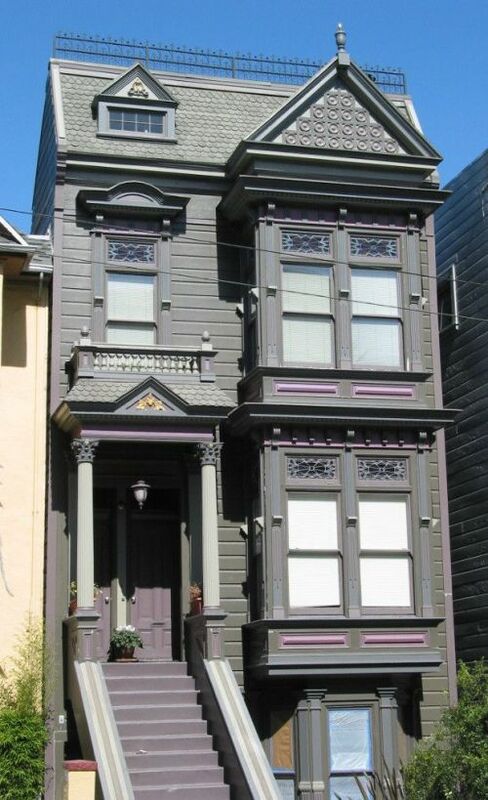 The Italianate style was the first national style to have a major effect on San Francisco's built environment. The Italianate craze first swept the United States during the 1840s and 1850s, initially as romantic country villas popularized by influential tastemakers such as A. J. Downing. Gradually the style filtered down to the middle classes and by the 1860s Italianate rowhouses were being constructed throughout most American communities, including the booming young city of San Francisco. The Italianate style underwent some important changes after arriving in California. Unlike eastern and Midwestern cities, where the style was typically expressed in stone or brick, in California, due to lack of adequate supplies of cut stone or lime, the style manifested itself in wood. The applied architectural elements, including the quoins at the corners of the house and the over-sized brackets at the eaves, are decorative versions of the masonry reinforcements. Signature elements of the Italianate style in San Francisco include bold brackets and entablatures, false parapet roofs which conceal the gable roof, narrow vertically proportioned windows and doors with projecting bracketed hoods. 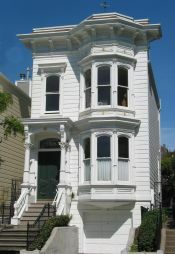 The flat-fronted Italianate, which was closest to its eastern counterparts, was the earliest variation of the style to appear in San Francisco. Flat-fronted Italianates were typically built on the fringes of downtown by large developers such as the Real Estate Associates. 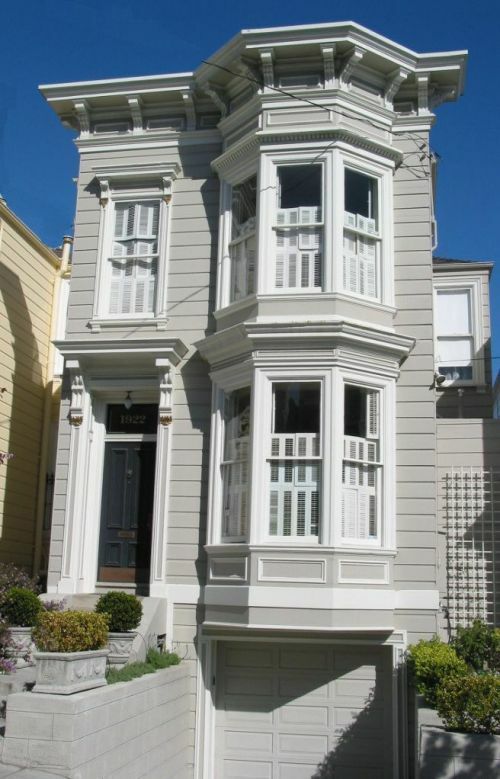 Flat-fronted Italianates are usually found in older neighborhoods that were developed in the 1860s and 1870s, such as the Western Addition and the eastern part of Pacific Heights. Unlike the later bay-windowed Italianate, the flat-fronted Italianate did not have projecting bay windows. Often located on generous lots, flat-fronted Italianates are often set back from the sidewalk a few feet and often have setbacks on either side. The facades are typically two stories in height, three bays in width, clad in rustic wood channel siding and embellished with a modicum of redwood ornament, often disguised to resemble stone. The most eye-catching element to embellish the façade of a flat-fronted Italianate are the bold bracketed cornices. Typically windows and doors are surmounted by flat window hoods or squeezed pediments. The entries are usually recessed and capped by a bracketed portico hood. Flat-fronted Italianates were either single-family dwellings or contained two or more flats. 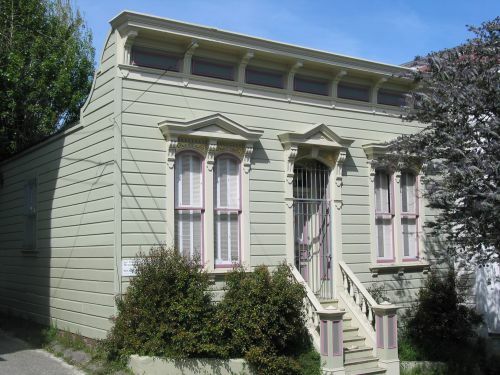 Flat-fronted Italianates were also constructed as single-story cottages, many of which are found in outlying Victorian-era neighborhoods such as Noe Valley and parts of Potrero Hill. The bay-windowed Italianate began to supplant the flat-fronted Italianate in the late 1870s and early 1880s as increased land costs shrunk lot sizes to the typical 25' x 100' or 25' x 80' dimensions. Unlike the more generously sited flat-fronted Italianates, the facades of the bay-windowed variation are typically only two-bays in width. The bay window arose in order to increase the square footage of each floor and to increase the amount of available light. The addition of a bay window also allowed the builder/architect to add more millwork and other decoration to the otherwise rather severe façade. The bay-windowed Italianate was embraced by San Francisco builders, particularly large-scale developers such as The Real Estate Associates, who constructed dense rows of nearly identical bay-windowed Italianates throughout the Mission, the Western Addition, Pacific Heights and elsewhere. The impact of this variation was so widespread that contemporary observers called San Francisco the "City of Bay Windows." By the 1880s these simpler stone-based embellishments of the flat-fronted Italianates were augmented by the addition of inexpensive and mass-produced redwood millwork. The bay-windowed Italianates often featured ornate columned porticos surmounted by turned balustrades. The flat-headed windows of the 1870s were replaced by segmentally-arched windows surmounted by projecting window hoods. The brackets grew larger and were embellished with flutes and incised ornament. The bulk of the ornament was reserved for the bay window which was embellished with incised spandrel panels, pipe colonnettes and dentil course moldings. The San Francisco Stick/Eastlake style is a complicated blend of various influences incorporating elements of what architectural historian Vincent Scully has termed the American Stick Style. This term refers to an architectural aesthetic that emerged in the 1870s and 1880s in which the structural system was expressed on the exterior by abundant millwork, or "stick-work." The Stick Style was first major Victorian-era style to dispense with imitation stone architectural elements and to embrace an entirely new aesthetic that embraced the underlying balloon-frame construction. The term "Eastlake," often applied to the style, was a misattribution of this wholly American fad, although architects working in the mode did on occasion take elements from the more Gothic influenced work of its unwilling namesake, British tastemaker Charles Eastlake. The Stick/Eastlake style was given national prominence in industrial and furniture exhibits at the 1876 Centennial Exposition in Philadelphia. 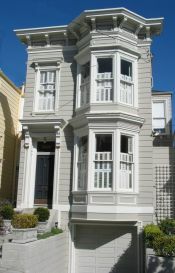 In San Francisco, the Stick/Eastlake style was primarily an ornamental style applied to the already well-established urban rowhouse prototype. Nearly identical in proportion to the bay-windowed Italianate, the San Francisco Stick/Eastlake style dwelling was usually two stories and the façade was two bays in width. The façade of the San Francisco Stick/Eastlake style rowhouse is typically dominated by a two-story, rectilinear bay window. The style is primarily distinguished by the enthusiastic application of flat strips of wood around windows and doors and elsewhere to express the underlying structural frame. The ornamental detailing is much more imaginative and non-naturalistic, incorporating so-called "Eastlake" millwork detailing such as sunburst-motif brackets, rosettes, florid vegetal motifs and even more excessive imagery. Most of the exterior detailing was obtained from local mills or ordered from catalogs. The roofline of the San Francisco Stick/Eastlake typically received a great deal of attention, with applied ornamental truss work and false gable roofs. San Francisco Stick/Eastlake style dwellings were constructed in San Francisco between roughly 1880 and 1890. 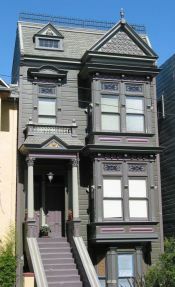 Examples can be found throughout San Francisco, particularly older Victorian-era neighborhoods that escaped destruction in the 1906 Earthquake and Fire such as the Western Addition, the Mission, Pacific Heights, Eureka Valley and Noe Valley. The Queen Anne style originated in England in the 1870s with the work of Richard Norman Shaw. The commonly used stylistic badge referred to the architecture produced during the reign of Queen Anne of England (1702-14), a transitional mode characterized by a blend of late medieval forms and classical ornament. Shaw's much published English country houses proved to be very influential on American architects and builders during the last decade of the nineteenth Century. Similar to the Stick/Eastlake style, the Queen Anne first caught in the United States as a result of the Centennial Exposition of 1876, at which the British government put up two half-timbered buildings to house their on-site staff. The Queen Anne or "Free Classic" style took America by storm, particularly in the design of large summer residences. With its picturesque turrets, porches and dormers, the Queen Anne was well-suited to large lots and it became very popular in semi-rural commuter suburbs surrounding Boston, New York, Philadelphia and Chicago. Gradually, speculators brought the style to the masses in the form of urban rowhouses and larger dwellings for the middle and upper-middle urban residents. In San Francisco the major challenge was adapting the ideally sprawling Queen Anne dwelling to the standard 25' wide urban lot. The problem was not longstanding as the serviceable urban rowhouse prototype used for both bay-windowed Italianate and Stick/Eastlake style, was given a new appearance with the construction of full gable-end roofs, turrets, integral balconies and other quintessentially Queen Anne details. The Queen Anne is principally about asymmetry, picturesque massing and a variety of color and materials. 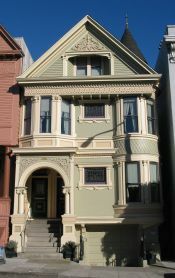 Despite the cramped conditions of San Francisco, this was done to good effect, especially on corner lots or double-width 50' lots, such as San Francisco's famous Haas-Lilienthal House of 1886 in Pacific Heights. 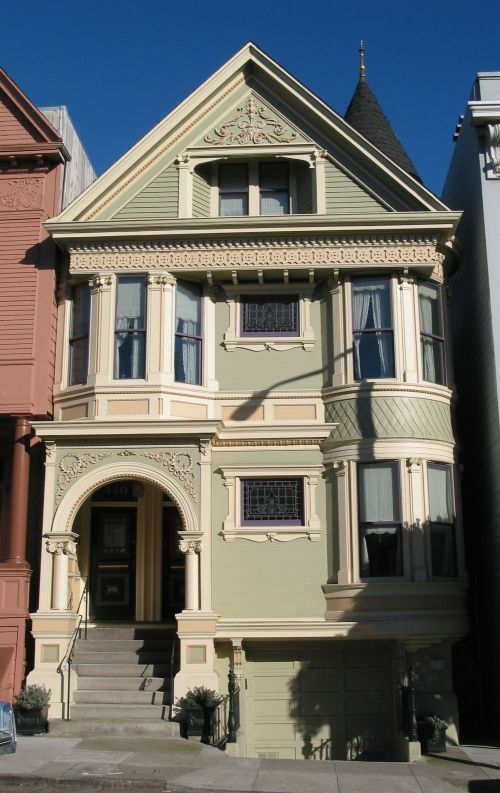 The Queen Anne style in San Francisco also manifested itself in smaller cottages for the working classes and many examples of these can be found in the City's outlying neighborhoods of Glen Park, Potrero, the Inner Sunset and Glen Park.